How? HOW is it already March? 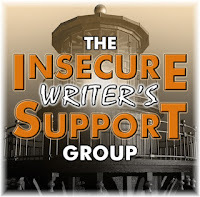 One way or another, that means it's time for an installment of Insecure Writer's Support Group. It's led by The Ninja Captain Alex, and his host of co-hosts: Lauren Hennessy, Lisa Buie-Collard, Lidy, Christine Rains, and Mary Aalgaard! Yes, I am insecure, but I'm going to do something wild: I'm going to take a deep breath and move on. I'm in a place right this second where I can do that. I don't expect this place to last for too long, so I'm going to enjoy it while I can. Writing is hard. It's hard on the soul. It's hard on the family, and it's hard on the personal life. Publishing is like being on a roller coaster, except you're the car and there are no tracks, but you're desperately trying to get all the passengers back to the station safe and sound while dropping them from twenty stories, and doing loopty-loops. So, instead of venting my frustrations with writing and the world in general, I'm going to take a pass. But my passing today doesn't mean others don't need something, and right now, I don't need to vent. Maybe you do. Today, I'm offering a spot, a limited time spot, to vent your insecurities and frustrations. I know we are all encouraged to be happy go lucky when it comes to queries, submissions and publishing, but sometimes it isn't all roses. If you want to share your woes and have them acknowledged, today is the day. Leave your comments, and I'll respond to everything, because sometimes it's nice to know that someone out in the world heard you. I hear you. Good luck out there, and keep on keeping on, whether that's writing, publishing, life, or other forms of chasing dreams. The no cookies woe is real, I tell you, REAL. Happy hosting day! My current woe is whether this whole self-publishing writing career thing is a good idea. Maybe it really would be easier to stick with some 9-5 office job, and just leave the writing to the realm of hobby. But the thought of that makes me sad. So, back to writing, and making this career thing happen. Oh yeah, that one's hard. All I know for sure is that I'm currently too far in debt to be anything but a full time office drone (though, I never seem to quite give up on the writing thing). I don't have a magic wand. That's my beef. I want one. You're a fairy godmother. Share. Well, the real key is to use it wisely. Baring that, I've got a couple lying about the house. If you send me an address, I'll ship you one! How lovely to be able to move on. Good for you! I'm stuck with my first novel insecurity. Eek! That first novel is something truly amazing and special. I'm still not over my first novel. I didn't really figure out how to move on so much as I got sick of being in the same place all the time. So yeah, I guess there's freedom after loathing. Writing can be a rough road, but when you see your work in print, it's worth it! Oh yeah, seeing it in print is AMAZING! I haven't finished my book yet. That's my biggest insecurity. Other than that, however, I'm good. That's a hard one, but you know, if you just put forward a little work everyday you can get there. You know what they say about how to eat an elephant? You eat it one bite at a time. Enjoy the feeling! I'm quite content too, at the moment, even though my current wip is driving me nuts, and I realised that the ending I created in my sleep last night is very similar to the one I wrote in my first book... Back to the drawing board! Everything I can think of to rant about just sounds like more of me whining. >_< I'll get back to work on writing stuff instead.